Helping more than one generation in a family is rewarding in many ways. Each member of the family brings his or her own experiences and history to the family dynamic, and understanding these interactions strengthens our relationships with our clients. When the family enters a time of struggle and we can help, it’s almost like we’re taking care of our own family. It is often the daughter or daughter-in-law who bears much of the burden of helping with aging parents. We know this burden is incredibly time consuming, on top of an already very full life. This is why we were so touched recently to open a Christmas present from a client whose parents – also clients – are needing support as they age. 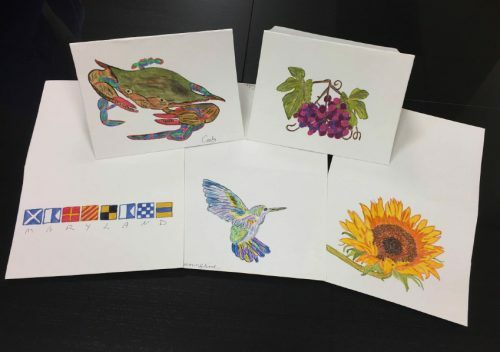 With so much on her plate, she took the time to draw and hand-paint beautiful notecards with seven different designs. She is a shining example of grace under pressure.